The first half of the film deals mostly with setting up the plot and laying out the mystery at hand. It’s not genius, but it does a good enough job to hold the plot together. Several anonymous tips lead the police to a gun smuggling ring that has been bringing assault rifles into the city. Things escalate into an investigation of the police chief who seems to know more than he’s letting on. Once all the story elements are put into place, though, things get more action oriented. The problem with this is the whole film has been following a mostly serious and ominous approach to the plot, so when the action kicks in and takes on a much sillier style it threw me off my bearings. I love it when anime successfully meshes comedy with more serious elements, but You’re Under Arrest comes across more jarring than meshed. This isn’t to say that the film is a failure. It’s actually quite entertaining once you get past the sudden change in tone. And towards the end of the film it finally starts focusing more on its heroines. You may have to set your expectations to ’80s action fare, though, as the action in You’re Under Arrest is pretty absurd, and increasingly so as the film goes on. The final car chase (actually the only one) is ridiculous, but if you can set your mind to jocularity rather than drama then you’ll probably be fine. I had a great time with the latter half of the film. It may not have been epic, but it was plenty entertaining. It’s odd that all the policewomen are stuck wearing skirts, though. 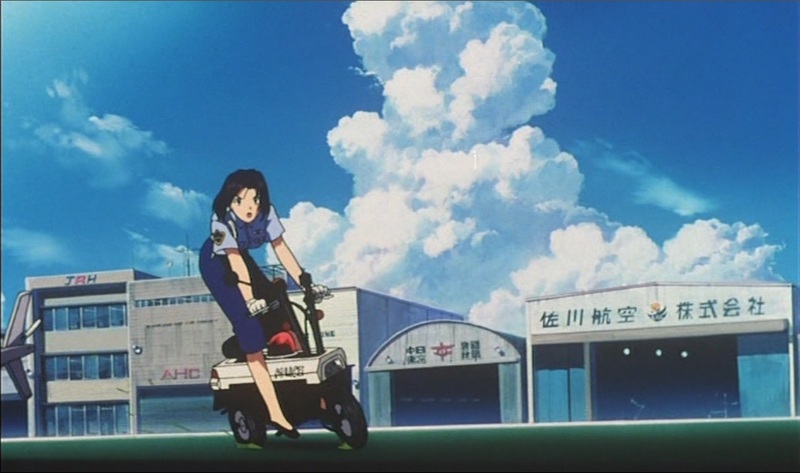 Even Natsumi wears a skirt while driving her minibike, which must be rather awkward to do. It’s nice that anime is so willing to have strong female leads, but sometimes it doesn’t quite get it right. Aside from Miyuki and Natsumi, most of the women on the force (and there is a strangely large proportion of them) are disappointingly panicky under fire. But as much as the series was clearly based upon an adolescent fantasy about women in uniform, at least the film stays away from needless fan service and sticks to telling the story at hand. I’m not quite sure why all the cops in this movie are unarmed, though. As an American the idea seems rather ludicrous. But I don’t know much about Japanese law enforcement. Almost all firearms are banned in Japan, so I suppose it makes sense for the police to also have lower access to guns. Still, it’s rather odd when the entire police force is left without any way of fighting an armed criminal group and must instead rely on Miyuki’s personal supply of Airsoft guns to defend themselves. Even weirder, though, is that Miyuki had enough guns to supply an entire squad, and that it all managed to fit in her tiny locker at the station. The film’s humor is most effective in the ridiculous action scenes, such as Natsumi hurling a tire though the windshield of a speedboat. Outside of the obviously unrealistic combat the jokes tend to fall flat. It’s the action that makes this film fun, so it’s a shame that it takes so long to kick into gear. I’m left with a pretty mixed bag here, but the film had me laughing enough to make it worth watching. It’s pretty average, but still enjoyable if you come to it with the right attitude.